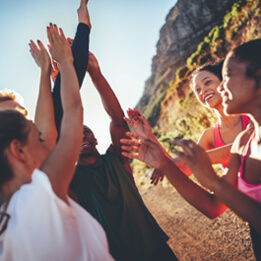 We work with people of all ages and physical ability for injury rehabilitation, enhancing your sports performance, screening for injury prevention or ongoing help to support your lifestyle. Be guided to a deeper understanding of your body and have the tools to reclaim your movement. Work one-on-one with a highly skilled physiotherapist, chiropractor, osteopath or massage therapist to find pain relief and get you moving. All of our practitioners utilize NeuroKinetic Therapy (NKT) – a highly effective tool in helping resolve pain and injury and restore movement. Life can be hectic and we are proud to offer our services around your schedule. Easy online booking, flexible appointment times and online consultations are available. We fit your busy schedule so that you can return to your work, life and play. Some of the conditions we treat include: headaches, migraines, TMJ, neck pain, whiplash, shoulder pain, elbow & forearm pain, wrist & hand pain, carpal tunnel, mid-back & chest pain, low back pain, sciatica, hip & groin pain, leg & calf pain, knee pain, ankle & foot pain, and plantar fasciitis. If you have questions regarding your condition and how we can help, we offer free 10 minute phone consultations.